There are many wonderful places to visit throughout Portugal. The region is known for its stunning coastlines, vibrant, bustling cities, rolling vineyards, and charming farmland. Because of everything the country has to offer, there has been a recent uptick in travelers from around the globe. While some visitors stick to exploring the city on foot, there are many ways to see the landscape. Recently, a group of adventurous women from the U.S. flew to Portugal as part of a wellness retreat. Their itinerary included a few days in Lisbon, several days in Arriaolos, a day in Evora, and a final night in Lisbon before departing. This schedule left them with plenty of time for exercise classes every morning, healthy cooking classes, meditation and yoga in a private villa, and, most importantly, two bike tours with Cycling Lisbon. On the first day in Lisbon, we led the ladies on a 7-10 Km ride along the Lisbon waterfront. The bike path takes riders past the famous April the 25th bridge, to the Monument of Discoveries, and finishes at the Belem Tower. Once there, we stop for a bathroom and Nata break, hop back on the bikes and ride back to Time Out Market in the center of the city. 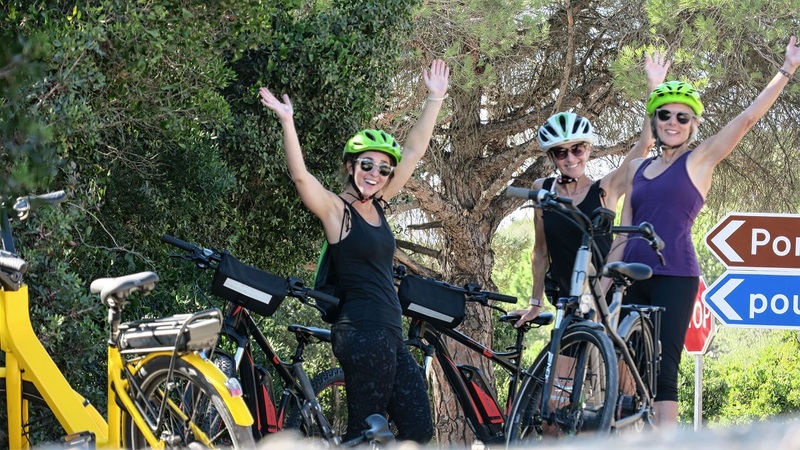 On their second to last day in Portugal, we again met up with the group to get them set up for ebike rides through the mountainous terrain of the Arrabida Natural Park, 40 minutes south of Lisbon. The 15 km ride takes the group through rich Mediterranean vegetation, offers extraordinary views of the Atlantic ocean and water surrounding Lisbon and ends with a spectacular cliff side picnic. These cycling tours are just two of the amazing offerings we have at Cycling Lisbon, but they make for an excellent addition to a vacation when visiting our beautiful country. Seeing the sites on two wheels instead of two legs means you can accomplish so much more in less time. Additionally, you get fresh air and exercise — so you don’t have to feel guilty about indulging in the delicious food and wine of the region. Contact us today for information about our rides in and around Lisbon. We’d be happy to get you booked on a bike tour in Portugal!